FILE - Russian Deputy Foreign Minister Sergei Ryabkov is pictured at the U.S. State Department in Washington, July 17, 2017. Russia's deputy foreign minister brushed back suggestions Saturday that an American being held in Moscow on suspicion of spying could be exchanged for a Russian citizen. 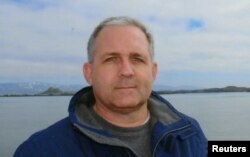 Paul Whelan, a former U.S. Marine, who also holds Canadian, British and Irish citizenship, was detained in Moscow in late December. His arrest has led to speculation that Russia could be using him to bargain for a Russian who pleaded guilty of acting as a foreign agent in the United States. But Deputy Foreign Minister Sergei Ryabkov said that discussing a possible swap involving Whelan and Maria Butina would be premature because Whelan hasn't been formally charged, according to Russian news agencies. Officials haven't given details of Whelan's suspected activities and he was initially identified only as an American. His concurrent Canadian, British and Irish citizenships became known on Friday. Whelan, 48. was discharged from the Marines for bad conduct. He works as the global security director for a U.S. automobile parts manufacturer and lives in Michigan. His family has said he was in Moscow to attend a wedding. In a column published by The Washington Post on Friday, his twin brother, David, urged the U.S. government to pressure Russia to release him. Also Saturday, the Foreign Ministry said it was seeking information about a Russian who was arrested Dec. 29 in Saipan in the Northern Mariana Islands, a U.S. commonwealth in the Pacific. In a statement, the ministry said Sergei Makarenko was sent to the U.S. state of Florida after his arrest and that it wanted consular access to him.